- what exactly is that other than a notice that is not illegal. as you have by now read up on these matters you will know that the law doesnt allow to add £60 unicorn food tax to the sum due. Post up the letter by all menas and we can tell you what is actually means in terms of procedure. 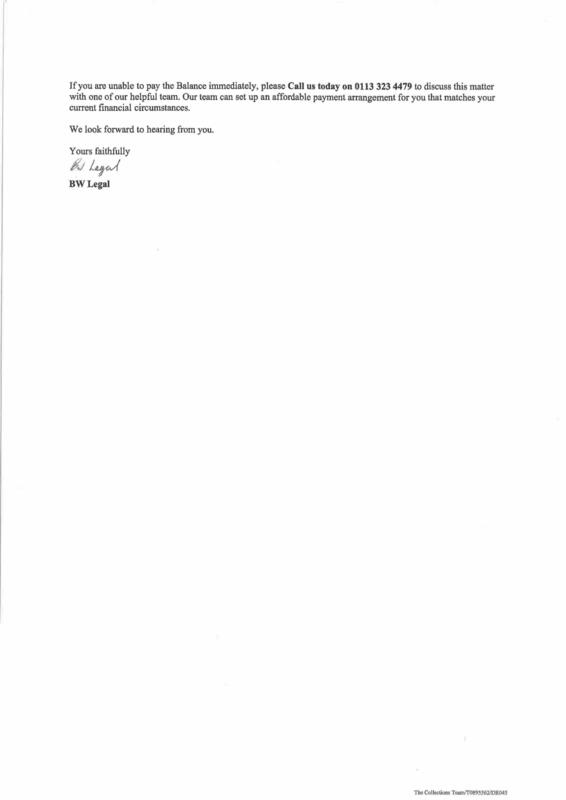 Please find 2 letters attached received from BW Legal. The first one is Cover Letter and second is the instructions to pay the Parking Charges. They have given 16 days from the date of the letter to pay or respond. Please suggest how to respond or what is the next step. don't use a PDF redaction program as the boxes your have used can be removed. The Excel letter did make me laugh. they know that they cant add £60 unicorn food tax just because you haven paid their demand and I like the bit about BW being their approved rentathreat. Approved by whom other than them? because sending out the usual rubbich lba and POC they do will lose their clients at least half of anything they claim for procedural reasons without you actually needing a defence. 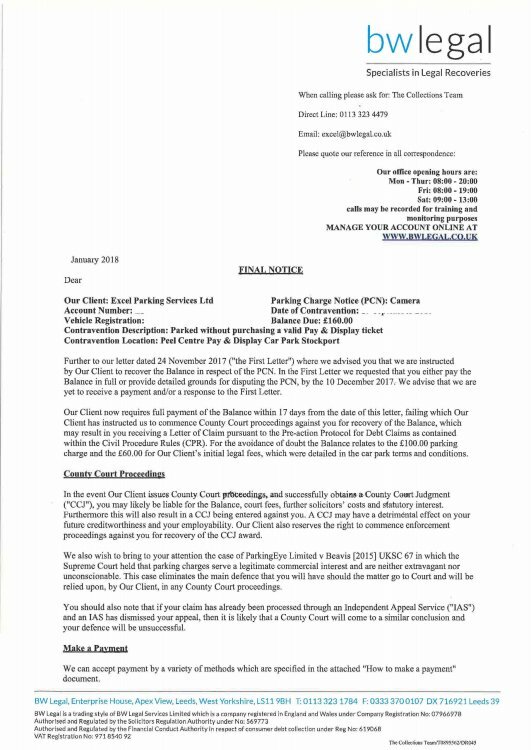 Received second letter on 3rd Jan showing as FINAL NOTICE to pay the parking charges. Please find the letter attached. Please advise should I wait for further letter/notice to come through. advice is still to ignore this. I suspect that you will get another letter as a pre-action protocol and it will be wise to respond to that. We will suggest that you use very strong language to then to make usure there is no abiguity in your rejection of their paymasters claims. Received Third Letter from BW Legal informing to pay the Parking Charges or to face County Court Claim. They have also sent some Forms to fill and send it back to assess my Debt condition. I have attached all the letters. Please advise what best can be done now. As the keeper of the vehicle I have no liability for any breach of contract your client may claim against the driver at the time as it wasnt me and your client has failed to create a keeper liability under the POFA 2012. Both you and your client are well aware the Peel centre is notorious for its appalling signage considering its layout and faulty equipment. As you are Simon Renshaw-Smiths second choice lawyers I dont really expect you to do any better than Gladstones in suppressing simple Simon's avarice but you know that he is going to repeat the usual pattern of losing any claim from here that is defended you will also know that it will be considered the said claim would be an abuse of civil procedures and I wil seek a full costs recovery for unreasonable behaviour. I expect you to provide STRICT PROOF as to who the driver was at the time and also explain the lawful reason why the sum of £60 has been added to the contrctual charge when the POFA expressly forbids it and in any case there is no allowance in contract law for such a demand. I know that this is your payoff for being a solicitor on the cheap but you should know better. I will use the attached Reply Form from dx100uk and send it along with the letter as per ericsbrother. After sending out the form along with the letter (as per ericbrother) on 10th March, I have not received any reply (letter) back from them. But, I keep on receiving lot of phone calls from Lowell Debt but I don't answer it. Considering it has been 5 months, are they still eligible to take further actions. I have drafted a letter and I need some advise on writing back to the Agency please. please dont confuse matters, keep them separarwe as different people look at the employment threads.